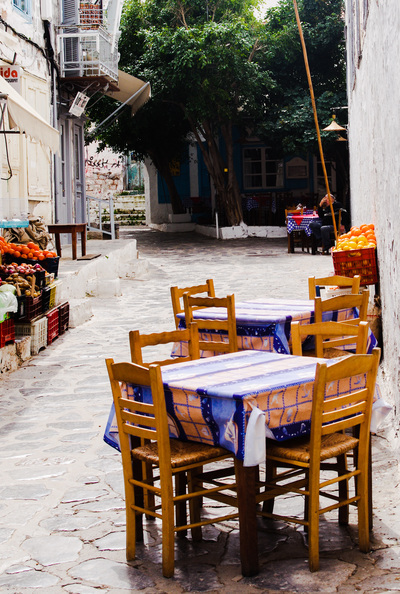 This little cobblestoned lane way on the Greek Islands is distinctive particularly as the blue tablecloths give it away a little. The fruit lined lane way is a perfect place to sit and relax while you admire the trees, balconies and blinds that also surround you. These little lane ways provide tourists with an opportunity to get behind the usual tourist scenes closer to the wharves. These lane ways appear homely, neat and tidy. You could almost be at home here. The little tables appear to be just waiting for you to sit down and enjoy the sunshine. You could choose some of the fruit or perhaps some seafood brought in on the fishing boats just a little further down the lane way. There are lots of little steps and doors along these lane ways but rarely do you see anyone coming or going from them. You wonder whether anyone actually lives in some of the buildings. There are sometimes people with donkeys walking along these lane ways but you don't easily see where the donkeys live. It's just a little mysterious. If you look closely enough, you can just see one of those doorways at the end of this lane way. I wonder who lives there.